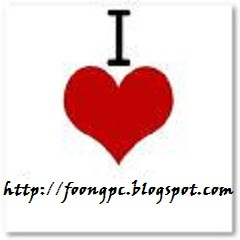 People, i know Foongpc has been very synonym to you all especially for those who has been his blog's lover reader. Yes he is a very kind-hearted blogger i guess and there's no doubt with his friendliness towards others. How I get to know him? 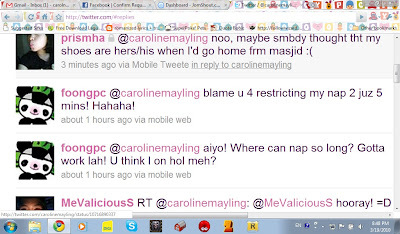 I was searching for people in Twitter who actually put their blog's link instead of putting their Myspace profile's link as website in their Twitter profile, and its happened to be i was on @foongpc's profile and saw his blog link. So, i clicked on it and read it. Yea i found such an interesting blog and i left comment on his twitter profile saying that nice blog of him (if i not mistaken). Here we goes, followed his tweets and same goes to him. Actually i was thought am I the one who first comment on this? So then he's keep complaining about imeem thingy all those thing. The next few days he tweet about traffic jam, and i can tell you that he tweeted about the traffic jam a lot! Seriously, that time am not sure its the twitter website problem or my other tweeps less tweet as my timeline just full with foongpc's traffic jam tweets! He tweeted about coffee thingy and i reply his tweet and yea he blame me for his sleepiness during daytime! Yet i still saying it as "Twitterville Happenings"
He, himself called his own-self as "night owl" and yet still wanna blame me? Oh forgot that he's the special one - Drunken Night Owl! Yes, it is actually just recently posted yesterday afternoon. Peeps! See how incredible is Foongpc! Being so NICE and yeah its TWO IN A ROW! 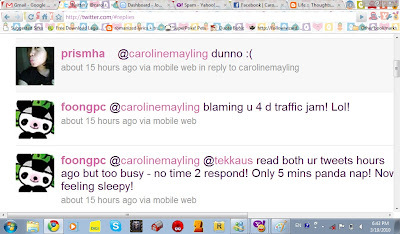 "foongpc @carolinemayling blaming u 4 d traffic jam! Lol!" "foongpc @carolinemayling blame u 4 restricting my nap 2 juz 5 mins! Hahaha!" Just like this would be enough. I just don't want some people misunderstand that i am obsessed with you, LOL! "Put The Blame On Me by Akon"
Anyway, am not going to post it here though as ITS NOT MY FAULT AT ALL! Whoever be the first commenter and agree with me, EXTRA LOVE will be given! I hope there will be no more post about Foongpc! I'm the 1st commenter! Yay! I get EXTRA LOVE!! Yippee!!!!! So, why are u so obsessed with me? Haha! Juz kidding lah! It's a line from Mariah Carey's song Obsessed that was playing on my laptop when I tweeted that time! I heard it and immediately thought of tweeting that! Haha! But judging by the zero comments here, I guess no one cares to read about me lah, haha! Btw, thanks for the mercy you bestowed upon me, haha! If not don't know how to defend myself against the full blast revenge! *shudder* LOL! @foonpc hmph! asking why 0 comments? cz i dint post it out. lol. paiseh later ppl really tot am obsessed with u but there is someone from jomshout.com read it and i think he did mentioned to u thr. lol. regret oso dint post it as now u're d 1st commenter pula! haha got all about u meh? u mean the entire post is it? XD so see how mean r u for blaming me?? hahahaha!